If you are looking for self catering holiday cottages in Derbyshire and the Peak District then look no further – Hillside Croft dated 1709 and of Grade II listed interest is an exceptional mellow sandstone self catering holiday cottage, nestled quietly amidst 6 acres of beautifully landscaped gardens and pastureland. Located in the Derbyshire Dales at the edge of the Peak District National Park and just over 1 mile from Carsington Water Sports and visitor centre this delightful cottage is central to all that Derbyshire, Staffordshire and Nottinghamshire have to offer. Pretty leaded lights set in stone mullioned windows, ancient oak beams throughout, revealed stone and timbered walls and cosy log fires set under inglenook fireplaces add to the charm of this beautiful large character cottage. In the mornings you will be greeted by pheasants, squirrels, rabbits, ducks and a host of wild birds awaiting breakfast – the countryside on your doorstep. There are 5 comfortable bedrooms, four of which are double and one twin giving sleeping capacity for 10 . Within these rooms are 4 further single beds and 2 single bed chairs giving total sleeping for 16. To give a fairer price for smaller groups, the prices quoted are for 14 staying at the cottage plus two cots, the optional extra 2 bed chairs will be charged per bed per night if required. See the prices page for full details. We also provide 2 travel cots. All bedrooms at this luxury self catering holiday cottage in the Peak District are furnished to a high standard with hand made antique pine furniture and co-ordinated furnishings. 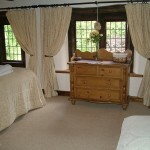 The floors are a mix of carpets, oak , tiled and stone floors lending character and warmth to this lovely cottage. 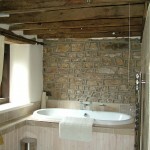 The Master bedroom is ensuite, with power shower, WC and wash basin. 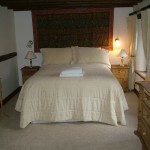 All rooms are airy and spacious with many attractive features and all overlook the beautiful gardens. Two of the bedrooms at Hillside Croft self catering holiday cottage are on the first floor a further 3 are on the second floor.The stairs between floors are very shallow making them easily climbed by both children and the elderly. There are 5 or 6 shallow steps between landings with seats between each floor. Access to bedroom 5 is via bedroom 4. 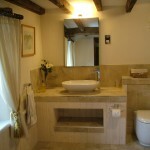 A master bathroom located on the 1st floor has a large Victorian style roll topped bath with bath shower mixer. There is a seperate walk in power shower, WC, bidet and washbasin. Shaving sockets are provided in both bathrooms. A baby bath, potty and WC stand for children are provided. The Hillside Croft self catering holiday cottage lounge is seperate to the dining room and both have magnificent oak beamed ceilings and warm log burning stoves. In the lounge are 3 comfortable sofa’s for cosy evenings in with friends and family, a TV with teletext, video recorder and DVD player are provided for your entertainment. A selection of videos are available on request. The cottage has full oil central heating throughout. Our beautiful dining room has a large farmhouse table seating 10 to 12 with ease, a large chicken coop dresser and church pew add elegant furnishings to this room. The log burner is set under the heavy beam of an impressive inglenook fireplace. A high chair is provided. Downstairs is a 3rd washroom with WC and washbasin. In the rear entrance hall is a payphone provided for your convenience ,internet access is available by arrangement, a charge will be made for this. Our farmhouse kitchen is a delight with underfloor heating ideal for drying those walking boots. There are antique hand made pine kitchen units with a double French pottery sink set in tiled and marble worktops. The windows overlook the beautiful cottage gardens, mint,lemon balm,chives, blackcurrents and fruit trees have been planted for your use. An automatic washer, tumble drier, dishwasher, fridge and fridge freezer, microwave and full electric halogen cooker with double oven are provided. Smaller items include, electric hand mixer, iron and board,coffee maker, toaster, kettle , tape recorder and radio, CD player and radio, Ipod Dock portable TV and hair drier. Hillside Croft is one of the prettiest self catering holiday cottages in Derbyshire and the Peak District, and is surrounded by beautifully landscaped gardens containing two fish filled ponds, with frogs, toads and other wildlife, it is covered by lillies and colourful marginal plants. Local wild ducks, moorhens and young are often in residence. The ponds are securely fenced for the safety of children. 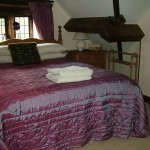 The cottage has a large hot tub in the gardens a lovely place relax surrounded by nature. We have three unspoilt fields totalling 6 acres surrounding this exceptional self catering holiday cottage in the Peak District and Derbyshire, one of which is planted with fruit trees the others grazed by ponies.These may be walked in with care. The drive entrance to Hillside Croft self catering holiday cottage is gated and private giving safety for children and security for your vehicles.Safe off road parking for many cars is provided along with cycle storage. A sheltered patio area with hardwood table and chairs, umbrella, large Hot Tub, BBQ and chimera is at the rear of the cottage, bordering lawns and a colourful rockery border. Childminding is available by arrangement. Meals, traditional or Indian are available by arrangement. If you are wanting total Relaxation then we can organise pampering and relaxation therapies. Visit our Special Requirements page for details on how we can help you to have a holiday to remember. 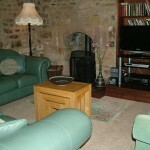 For the best in self catering holiday cottages in Derbyshire, Hillside Croft is a must. If you require any more information on Hillside Croft or any of Offcote Grange’s self catering holiday cottages in Derbyshire and the Peak District, please do not hesitate to get in touch.